A rekindled friendship (thanks to Facebook) and a heart open to new experiences led Sylvia Boggs to hot yoga. She and one of her childhood best friends spent four hours together catching up after reconnecting through social media. But it was something that her friend spoke about with such animation that caught Sylvia’s attention, and that was hot yoga. “I’ve made it a practice to try to honor other people’s passions,” Sylvia said. Now her friend’s passion has become her own—December will mark the sixth year since Sylvia has incorporated hot yoga into her life. “It’s changed my life on so many levels,” she said, crediting the practice with healing her physically and emotionally. After three years of practice, Sylvia said she finally felt the rod in her back didn’t limit her. 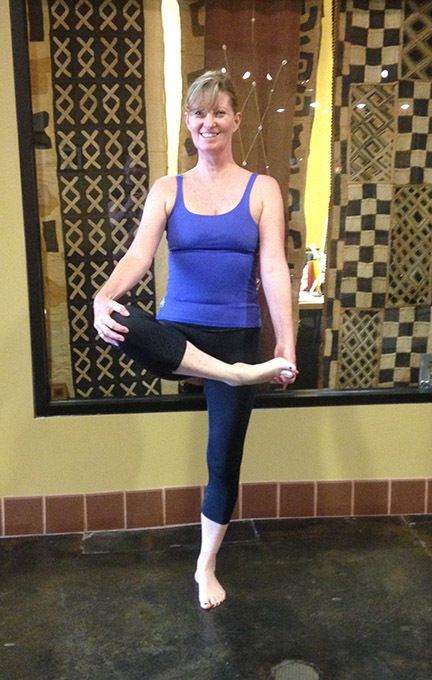 A continued commitment to hot yoga helped her heal through injuries and open her shoulders. “The list goes on and on,” she said. Sylvia introduced her youngest daughter to hot yoga, but two years passed before she got hooked on it, she said. Not until she texted her mom that she wanted to try it again did it become her decision, and that was key. That doesn’t stop Sylvia from trying to introduce the practice that she loves so much to others. She explained that she’ll give lessons in pranayama deep breathing—the breathing exercise at the beginning of every class—to anyone she brings. Finding comfort—in and out of the studio—has been a challenge at times for Sylvia. She’s had issues with claustrophobia, but fortunately yoga is ideal for its relaxation techniques that alleviate that anxiety. A loving, welcoming, accepting environment is exactly what Sylvia said she has found at Sterling Hot Yoga Lexington—both in and out of the hot room. But that doesn’t mean Sylvia isn’t afraid to step out of her comfort zone. She and a friend just recently celebrated their first season of their kayak rental business, Central Kentucky Kayaking. The two decided they wanted to open a business together and had an opportunity to buy property with frontage, but they hadn’t planned on a kayak rental business from the outset. “Everything just happened like it was supposed to for us to be able to do this,” Sylvia said. Perhaps it’s a side effect of her hot yoga practice that’s pushed Sylvia into being open to new experiences. After all, that sums up her practice journey. Sylvia isn’t just learning something new about herself; she said she makes a conscientious effort to tune in to the dialogue, as well. Even after six years of practice, she said she still hears something new. And she’s taken her attentiveness to detail in yoga postures outside of the hot room to be a better listener. The positive physical, mental, emotional and spiritual changes Sylvia has experienced from her hot yoga practice have not gone unnoticed by SHY Lexington owner Jodi. Though Sylvia must face the ups and downs of life as everyone does, a consistent hot yoga practice appears to give her the positive outlook to help manage them. “Every time Sylvia practices, the joy in her life shines brighter,” Jodi said. There isn’t one part of Sylvia’s life that her hot yoga practice hasn’t affected. And the steamy conditions in the hot room have helped Sylvia manage the local climate, too. Feeling the chill of winter weather? Join Sylvia at Sterling Hot Yoga Lexington and warm up with our $30 for 30 days of unlimited yoga introductory special, and begin your journey today! One Fire. Hot Yoga Festival. One Fire is a Yoga Festival who’s mission is to highlight the best of the hot yoga world, building bridges within the hot yoga community and between the hot yoga community and other yoga traditions in a festive environment. It will be an amazing 4 days of fun, love, laughter, and of course, lots and lots of yoga! Look for our Sterling Hot Yoga Booth. Day passes and complete four day passes are available. Show up for Katie at SHY Lexington’s special donation-based class to help provide her a much-needed doula during childbirth after her husband passed away earlier this year. Of all the moments in life where you wouldn’t want to be alone, giving birth is probably one of the biggest ones. But that’s exactly where Katie Powell finds herself. Her husband, Zac, passed away unexpectedly on July 4, leaving her to deliver their first child—a son due on Oct. 27—without him. Though her family and his family are somewhat close by, none are really local. Prior to losing her husband, Katie, like most expectant mothers, was apprehensive of all the changes having a baby would bring. With the help of Sterling Hot Yoga Lexington and The Birth Haven, Katie won’t have to start her journey into motherhood without the support she needs. The Birth Haven, based in Lexington and serving surrounding counties, provides doulas—or birthing companions—to help pregnant women and their partners make the birthing experience a special one. With Katie having lost her husband, a doula would provide an especially vital role. Just last year, Jodi C, owner of SHY Lexington, selected Julie with The Birth Haven to support her and her husband during the birthing of her daughter. When Jodi found out that The Birth Haven knows women who needs a doula’s support but can’t afford it, she knew she wanted to help. On Friday, Sept. 4, 5:30pm SHY Lexington is offering a donation-based, all-levels vinyasa class to make a difference for Katie at a time when she needs it the most. Donations will be accepted at the studio until October 1. Register online to reserve a space Sterling Hot Yoga Lexington. “Our community is providing a service for a woman about to go through an amazing experience with amazing support,” Jodi said. Katie’s midwife had recommended a doula, and while she and Zac had discussed finding one when she first got pregnant, they decided they couldn’t do it for financial reasons. Many students try Sterling Hot Yoga for the physical changes they hope to see—a trimmer waistline, toned arms and legs, and improved balance, strength and flexibility. But an even more profound change, in many ways, that comes with a hot yoga practice comes from within. Samantha Wells knows that firsthand. She started practicing at Sterling Hot Yoga Mobile just a few weeks before the 30-Day Spring Challenge began, having never tried hot yoga before. “I avoided it like the plague,” she said of the heat. Putting those former notions of hot yoga aside, she quickly committed to completing a 20-class goal to keep her newfound practice consistent and relied on her teammates to help hold her accountable. What Samantha found on—and off—the mat was not what she expected. Through sweat, patience and determination, she found a physical acceptance she didn’t realize she needed. “This is me. This body is mine. It may not be what society tells us is ‘beautiful,’ but I am learning to love it,” she wrote. “What most people can’t see when looking at this picture is this body feels so much better than it did two months ago, it looks better than it did two months ago and it’s mine. And I’m proud of that. Samantha’s new perspective on hot yoga was reinforced when she recently revisited her vision board to reflect on past goals and set new ones. She was struck by the irony of one of her posts that incorporated a popular hot yoga saying about the practice’s physical effects. That self-acceptance gave way to a more determined Samantha during a recent kayaking experience. Despite typically avoiding such activities because of her weight, she decided to give it a try. Perhaps that resolve to overcome challenges outside of the hot room was strengthened by her resolve in it. Not only did Samantha meet her 20-day goal commitment, but she exceeded it by four classes! During that time, there were physical changes, too, she said, that included increased flexibility, regulated blood sugar, improved muscle tone and a feeling of balance. But most importantly hot yoga made her believe and accept that she is beautiful from the inside out, and she is eager for others to experience their own internal and external transformations. Come practice with Samantha and get started on your own yoga journey with our 30-day introductory special! Jana Rocker reaches her ankle in Camel after one year of practicing at Sterling Hot Yoga Works Mobile. Most new students who practice at Sterling Hot Yoga Mobile are intimidated by the level of heat in the hot room. Jana Rocker was, too, when she signed up for her first class a little more than a year ago. Taking that first step to try hot yoga wasn’t an easy one. Cancer took its toll on Jana’s life at a young age. She lost her arm as a result and watched helplessly as friends suffered and died from the disease. That experience fueled her calling to pursue cancer research, but she dropped out of graduate school in 1995 when a professor told her she couldn’t do science with one arm. She ranks her decision to try hot yoga as “one of the life-changing scary moments of life.” Though the yoga studio website assures that hot yoga is for everyone, she still wasn’t sure how it would be for her having one arm. Jana does her best in each and every class and she follows modifications on various postures to get the benefits from them. With master’s and Ph.D. in hand, Jana now works for the University of South Alabama’s Mitchell Cancer Institute “to help others not have to go through what I went through,” she said. Between her demanding schedule of research and publishing, plus a move, Jana came up just a little short of her 15-class goal during the 30-Day Challenge. But she saw its merit as a learning opportunity. Jana did manage to reach a pretty exciting milestone nonetheless. She was able to reach back and grab her heel in Camel. Hot yoga’s impact on Jana’s life doesn’t end there. In the year she’s been doing yoga, she’s lost 30 pounds, experienced fewer gout attacks and gained mobility in her fused ankle. Jana is such an inspiration to everyone who practices at Sterling Hot Yoga Mobile. She is proof that Sterling Hot Yoga works! If you’d like to see what benefits your hot yoga journey holds for you, get started today with our 30-day introductory special! Tree pose and toe stand are the last two poses in the standing series of our Gold 90 and Sterling 60 classes. They seem fairly straightforward, but there are some aspects of the tree pose that bear clarification. The tree pose that we do in our Gold 90 and Sterling 60 classes has the following purpose: To open up the hips, knees and ankles in preparation for toe stand, and eventually, the lotus position. Compare the woman on the left doing lotus to the woman on the right doing tree pose in the photo below. Notice how in both poses the feet are near the hip creases, knees are extended away from the center line of the body and feet are turned outward. Putting your body into lotus can be challenging on the hips, knees and ankles, and like many poses, some people come to it relatively easily while others struggle for a long time to get there. Tree pose is a great way to help prepare the body for lotus. Tree comes at a point in the series where your body is relatively warmed up. Your knees and hips and ankles have had the opportunity to open, and although your heart may be pounding, you are encouraged to slow down, focus and balance. Not such an easy thing to do! 1. Ground yourself in alignment. 2. Pick up your right foot with your left hand and if you need to, hold your right knee with your right hand. Be careful of your knee and your ankle. At any step, if you feel discomfort, proceed with care. If you feel pain, back off. The goal is to put your foot in your hip crease, but your body proportions may require you to place your foot in a different place! Look at the images below: The first woman’s foot is on her leg and it may never be on her hip because her shin bone is relatively short and her hips aren’t yet open. The second woman’s foot is super high on her costume, because her shinbone is really long! Both are doing the posture correctly for their body type and for the condition of their hips, knees and ankles. Tightness in any of these joints may keep you holding on to your foot, and that is perfectly okay! 3. Slowly, gently allow your knee to come down toward the floor. Now remember the lotus pose — the knee is positioned away from the center line of the body approximately 45 degrees — so in tree, it is absolutely appropriate to have your lifted leg positioned away from the body. The ball and socket of your hip joint may never allow you to position your leg so that it’s parallel to the standing leg and by forcing it, you could injure your hip! Look at this group shot of people doing tree pose — everyone is trying the right way; no one’s legs are parallel. Not even close! 4. Eventually, when the hip joint and the hip flexors open up enough, you will have two legs in one line FROM THE SIDE like the photo on the left. 5. The last part of the pose is to find alignment on all planes. Stretch your spine up, and stretch your tailbone down to prevent your rear end from sticking out. Look in the mirror and work to get your shoulders level and hips level. Avoid sinking into the standing hip. The yogi on the right is out of alignment — see how her shoulders are not level and her hips are not yet level? This is common especially when you have to hold your foot. But she’s working toward it and will be there soon! If you are challenged by tree pose, that’s okay! Start slow, hold on to your knee if you need to, work slowly, take your time, focus on your breath and alignment as best you can. And know that you’ll be on the floor resting very, very soon! Iron Hour helps build core strength, which helps improve your postures in the Sterling 60 and Gold 90 hot yoga classes! In many of the standing poses in our yoga series, we talk about the locked knee. The locked knee, in good alignment with the ankle and the hip, is absolutely important, and it takes a great deal of strength to maintain it for more than a few moments. In Standing Head to Knee, locking both knees is especially challenging. In this wonderful photo example, Jason Winn is executing the full expression of the pose where his arms are extended, no longer holding on to the foot. Yes, absolutely, Jason has a tremendous amount of strength in his legs, but it’s core strength that’s holding it all together! Strong abs, strong legs and strong arms (and a lot of determination) are what allows Jason to pull off this beautifully executed pose. It’s strength that supports flexibility and flexibility that supports strength. And now, Sterling Hot Yoga Works can help you to attain both. Adding Iron Hour to your practice is a great way to improve your Standing Head to Knee and many other poses! But remember, taking the Sterling 60 and the Gold 90 also helps you to maintain good overall health! It all works together!